Have you taken the professional editor route? When my crit partner told me that he got his manuscript professionally edited before querying, it made me wonder why I didn’t think of that option. I am sure if I had gotten my manuscript professionally edited it would have made a huge difference to both my story and writing. Crit partners bring such a lot of insight and give an amazing feedback on our stories, they make us work on our weaknesess, just imagine the good a professional editor can do to our story. Getting our manuscripts professionally edited does increase our chances of being published, whether we submit to an agent or approach a publishing house directly. I have tucked away this idea into my mind for my trilogy. In the near future, I will be travelling that path. Now, on another note, I want to share with you all about a literary agent whose work I have admired from a long time and who has also been on my list of agents to query. Mary Kole, one of the well- known literary agents, who is now with Movable Type Literary Management, and had earlier worked at Andrea Brown Literary Agency, has started a manuscript editorial and consulting services from this year. I have been following Mary’s blog Kidlit for many years. Mary offers wonderful advice on all aspects of writing: from plotting, creating tension, pace, antagonists, character arcs, story lines to query letters. I can honestly say that the examples Mary gives on her blog are like attending creative writing lessons. Her advice is spot on and coming as it is from an agent’s perspective it helps writers in a big way. I have personally benefited a lot from her blog. Mary’s book Writing Irresistible Kidlit: The Ultimate Guide to Crafting Fiction for Young Adult and Middle Grade Readers has garnered rave reviews from writers and readers. Most of my writing friends online have recommended it to me. Whether a writer is seeking a sharp eye on their query letter or a comprehensive editorial review of their entire manuscript, Mary’s editorial and consulting services can get the writer closer to their publishing goal. Mary’s editorial work is meant to be educational, encouraging, actionable, and geared to helping a writer achieve their dreams. Check out Mary’s website for details. Have any of you taken the professional edit route? What did you feel about it? Do you think it got you closer to your publishing goal? Please share your views as it will help us make our decisions. What are Literary Agents looking for? More than a year back, when I was searching for an agent for my Middle Grade Novel, I spent a lot of time on Literary Rambles trying to get familiar with agents’ tastes. In this post I am sharing what I have now realized about agents. They all are looking for fresh, unique voices. For characters who by the end of the book are more flesh than fiction. Practically every agent’s requirement is upmarket, high-concept, character driven, well-plotted books with fast pacing, emotional resonance and beautiful writing. 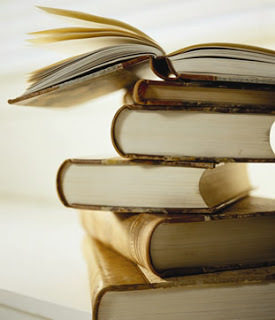 Most of them are on the lookout for books with literary spark as well as commercial appeal. In both Young Adult and Middle Grade, the emphasis is on the unusual and unforgettable characters with vivid settings. Many agents stress that they are eager for stylized voices which sound authentic. Quite a few of them advice that writers should not chase trends as trends change by the time books are completed. Just write what comes to you, is their advice. Make your story the best it can be. Rewrite, rewrite and rewrite some more. Polish, polish and polish. One of the best pieces of advice I came across was, “A great voice is paramount; whether first or third person, I need to fall in love with your voice. Your characters must be memorable and you need to make me root for your protagonist right from the start. Show your protagonist's journey, through the use of dialogue, the senses, actions and reactions, rather than tell through the use of narrative. Finally, a great opening is absolutely essential. You need to grab me immediately, and keep me turning the pages. If you can make me laugh out loud, cry, or keep reading late at night, you may have a winner!" Practically every agent’s pet peeve was pages of exposition, dry description, flat writing, lack of tension and dramatic conflict, clichés, banalities, lack of a striking voice and dialogues that didn't sound right. Most of the agents said they were looking for stories that grabbed them and kept them reading all through the night. I read lots of books last year, by authors who had chosen to either self-publish or go with a smaller press or publishing house. And almost all the books I read were what I called great books. I wonder what was the reason they were turned down. Most of these authors told me that agents (and not just a few, but several) had turned them down. Do you feel getting an agent is as much dependent on luck as on writing? What’s your take on this agent scenario? Is having an agent a big deal? Can writers get published without an agent? I would love to hear all your opinions. Today I have an interview with Editor/Publisher Sayoni Basu. Sayoni together with Anushka Ravishankar started a new publishing house called Duckbill, partly owned by Westland Books. Aimed at young readers, it was launched in May 2012. Q What was the reason you set up Duckbill Publishing, leaving the safety net of a successful career with Amar Chitra Katha? I love editing and creating books. My role at Amarchitrakatha and also earlier at Scholastic was increasingly suit-like and policy-making and I really missed the excitement of discovery and creation. Also, both Anushka and I felt there was a lot more which could be done in the children and young adult book space, and we wanted to do it. So Duckbill was set up! Q What kind of books is Duckbill hoping to publish? Really good, fun books. One of the great things about being independent is that we are not tied to any number of books we have to publish. This is very liberating. We will publish only when we find a book which we feel deserves to be published, which is a story the world should read. Primarily fiction. For the moment we are not looking at picture books, though we hope to in the not too distant future. Q What will be your strategy to compete with the more established publishing houses? I don’t really see any competition—there is enough room for everyone. There are not enough books, so we can all thrive. But yes, clearly for authors who can publish with anyone they choose, our USP is that we believe we have a lot to offer in terms of editorial and marketing. We also have the luxury of time, and we want to work on each book we sign up so that it is the best book it can be, and we will try to sell each book in the best way it can be sold. Q Why is there a lack of children’s books, especially a series, in the Indian Market? Children’s books are harder to sell—unless they are educational. They are also harder to market. Since the numbers are smaller, authors earn less, and therefore are often not willing to invest the years that it takes to develop a series. Publishers too often lose interest if the first couple of books in a series do not sell too well. So it is really a question of both author and publisher saying we will do, and doing it! Q You already have a good online presence. How important are Social Networking sites in promoting books? It is early days to say! The problem is that children are not on social networking sites, their parents are—and I am not sure that parents look for children’s books when they are on these sites! (It is of course different for young adult books.) But we do believe that it is vital for a small unknown brand, because you are building a community and eventually hopefully your potential customers will hear! Q What are you looking for in your submissions? Good unusual stories and a strong voice. Q What advice would you give to aspiring writers? To write for the pleasure of writing. If one thinks of publishing and fame too soon, the story you are telling gets compromised, because inevitably one is thinking of what-will-make-my-book-sell rather than what-is-going-to-happen-to-my-characters. Q We keep hearing about catch them young. But still there are not many good Picture Books in India. What is the reason for lack of good quality Picture Books in India? Because there is not much of a culture of reading picture books. As a society, we look for educational content for our children and probably most parents would rather buy multiple ABC and 123 books than a picture book which simply tells a story. Also, picture books by very definition tend to more expensive because of the art and four-colour printing, and many parents feel inhibited by the price. But it is changing slowly! Q You have had several successful innings starting with being the editor of Puffin, then moving on to Publishing Editor of Scholastic. From the books you edited, name three of your favourite books. Q What do you think is the reason Indian writers writing for children don’t do well abroad? I think Western societies still prefer their children to read stories of familiar worlds rather than the unknown and foreign. Unlike kids in India who grow up reading stories from all around the world—possibly for English-reading kids more from other parts of the world than from India!—there is always a certain amount of reluctance, especially for UK and US publishers, to pick up Indian children’s books. 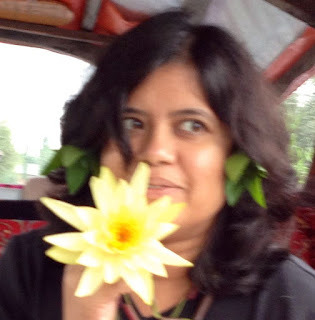 Sayoni's Bio: Educated in Calcutta and Oxford, Sayoni Basu has worked in publishing for more years than she cares to remember, at OUP, Penguin-Puffin, Scholastic, Amarchitrakatha. She is now primary platypus at Duckbill Books. She has also worked as a librarian, security guard and tea lady. Thanks Sayoni for agreeing to the interview. We all wish you lots of success in life. Last month I attended my first Lit Fest. The Bangalore Literature Festival was also the first time Bangalore was hosting such a festival. Usually these festivals are held in Delhi, Mumbai and Jaipur. I was thrilled to see a decent crowd (I had expected a smaller crowd as we keep hearing about the dwindling number of book readers). It felt great to be in the company of like- minded people and surrounded by lots of books. I especially enjoyed the discussion ‘Business of Books’ moderated by my publisher Annie Chandy Mathew (Unisun Publication). V.K Karthika's ( the editor of Harper Collins India), discussion was informative as well as enlightening. She said that writers should stop seeing editors as monsters who prevent their books from being published. Infact, it was the opposite. Editors are eager to see manuscripts. She urged writers to simultaneously submit to several publishers to better their chances of getting published. One of the things I liked in her discussion was the reason publishers turn down collection of stories. She said that she has seen that in collection of stories submitted, one or two of the stories are great, the rest don’t match up. So the publishers pick the good ones and ask the writers if they can use it for their anthologies. The editors participating in the discussion mentioned that many times they turned down manuscripts on the basis of the cover letter. If the letter was full of grammatical errors and not well written, it showed that the manuscript too would suffer from the same flaw. How about you all? Have you attended a lit fest? If yes, what did you think of it? If no, would you like to attend one? I would love to hear your views on it. I had read about this group on my dear friend Alex Cavanaugh’s blog. Alex is also my blog superhero (he must be having a magic power to be able to write, visit hundreds of blogs as well as do a day job). Gosh, this Ninja’s sheer energy makes me super envious. Though eager to join this group, I was worried about sharing all my writer insecurities. That’s the reason I kept putting it off for so long with the excuse that I don’t post on Wednesdays. I think 2013 is going to see a bolder, stronger and more determined me, so here I am with my first post for the Insecure Writer’s Support Group. I even tweaked my blogging schedule for it. 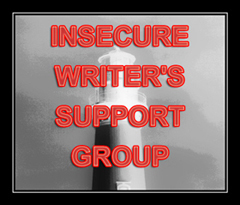 As I have reduced my posting day to Fridays, I will now post on the first Wednesday of every month so that I can be a part of the Insecure Writer’s Support Group and get loads of support from you all. IWSG meets on the first Wednesday of every month to support and encourage each other and share our insecurities. If you want to join click here. One of my biggest insecurities regarding my writing is that I am unable to stop worrying that my writing is not good enough. Like the protagonist of the book I finished writing recently, Rahul, the nine year old boy feels he is not good enough for his parents who are overachievers, I too feel that my writing is no great shakes. I always feel every other writer writes much, much better than me in terms of plot, language and voice. This thought was further entrenched in my mind when I started querying my Middle Grade Fiction in 2011. Though every agent who read the query and the sample pages praised it, cynical little me brushed it off with the thought that they were being polite. If they thought it so nice why couldn’t they offer representation was my argument. As the rejection letters piled up, this thought was further cemented in my mind. Even though one of the agents asked me to keep her in my mind for my next book, I didn’t believe her. I was like maybe she had nothing else to say. This year I hope to overcome this habit as it is seriously affecting my writing and querying. I would like to have more faith in myself and my writing. What’s your biggest writing insecurity? I am both curious and eager to hear about it.